Richard T. Ainsworth is Adjunct Professor of Law New York University and Boston University, and Musaad Alwohaibi is SJD candidate at Fredric G. Levin College of Law, University of Florida, Gainesville, U.S. In this second part of a two-part article, blockchain technology and its potential to transform tax administration is considered: in particular, with reference to its application to the introduction of value added tax in the GCC. Consensus is the critical difference between Digital Invoice Customs Exchange (“DICE”), (as discussed in Part 1 of this article) and tax-based blockchain applications. Where DICE secures real-time transactional data and stores it in central databases located at each tax administration's computer center for later risk analysis, blockchain performs risk analysis in real-time. The blockchain consensus mechanism is the last stage before the issuance of the formal VAT invoice. Assume a manufacturer in the origin jurisdiction produces 100 widgets for export that are sold to “Seller A” for 10,000 currency units each (a domestic sale). “Seller A” reaches agreement with “Buyer B” in the destination jurisdiction to acquire 10 of these widgets for 11,000 currency units each (an intra-community cross-border sale). After import Buyer B re-sells the widgets to a dealer in the destination jurisdiction, who sells on to individual final consumers. Assume that a distributed VAT ledger records all the transactions involving each of the 10 widgets from the manufacturer to Buyer B. It records the acquisition of materials to produce the 100 widgets (Block 1), which are transferred to Seller A (Block 2). 13 We are concerned with the cross-border sale to Buyer B in the destination jurisdiction (Block 3). If consensus is reached Block 3 will be bound to Block 2 in the same manner as Block 2 was joined to Block 1 in the distributed VAT ledger. 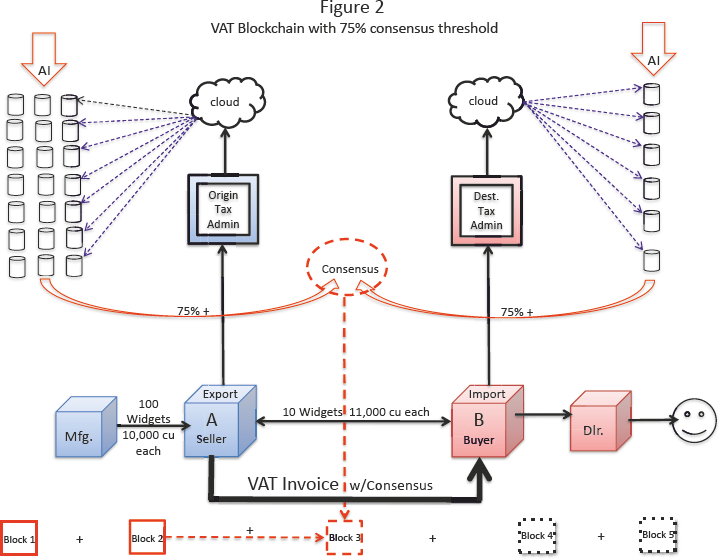 When Seller A and Buyer B agree to the terms of the sale/purchase of the 10 widgets for 11,000 currency units each, the rules of the distributed VAT ledger will require both parties to transmit this tentative agreement (a pro forma invoice) in an encrypted digital file to their respective tax administrations. From there it will pass to the cloud, and then to each of the assigned nodes in each jurisdiction. The consensus mechanism verifies (through AI-based risk analysis) the appropriateness of the cross-border transaction. This example is modeled on a transaction where the origin jurisdiction is France with a GDP (2015) of 2,183.6 billion euros, and the destination jurisdiction of the Netherlands with a GDP (2015) of 678.5 billion euros. If the consensus mechanism requires a commitment of computational resources comparable to the relative GDPs of the two jurisdictions, France will be required to dedicate 21 computer “nodes” to this exercise, and the Netherlands will be required to provide 6. Each of the nodes will be asked to approve or disapprove the proposed transaction. 14 If we further assume that the consensus threshold is set at 75 percent of the French nodes and 75 percent of the Dutch nodes, then consensus would be registered (automatically) if approvals at this level were reached. The invoice is the most critical VAT document. A blockchain-based regime will require that every valid VAT invoice must display a digital fingerprint derived through the VAT blockchain consensus process. In this case, the fingerprint will identify that Block 3 is permanently linked to Block 2. The entire history of the commercial chain (forwards and backwards from this cross-border transaction) will be able to be followed. A handheld scanner (similar to the scanners used in the scheme in Quebec, described in Part 1 of this article) that is connected to an approved tax-auditing program would be all that is needed to immediately pull up the entire commercial chain for an item from a valid invoice. To perform its function, each node will need to have immediate access to all standard invoice-level data about both parties (name, address, VAT ID, price of each item, volumes involved). In addition, all nodes will be able to conduct independent artificial intelligence (“AI”)-facilitated risk analysis. The best AI systems allow these inquiries to be made in natural language, and the AI operators will be trained auditors who know the industry involved. Because this regime employs government nodes, each node will have access to large numbers of public and private databases. Statistical anomalies will be identified in real-time, and authorities will be alerted. AI will move (or be directed) through available data points. Analytical approaches preferred by node managers will guide the analysis. Are the prices charged below market? Is the buyer or seller a newly-registered taxpayer with insufficient capital to engage in transactions like those proposed? Has either tax authority specifically notified one party that previous deals involving the supplier had been traced to a VAT loss and/or had involved carousel movements of goods? Has either tax authority specifically notified one of the parties to the current transaction that other Missing Trader Intra-Community VAT fraud characteristics (such as third party payments) have occurred in other transaction chains by this taxpayer? Are the buyer and seller current on other tax obligations (income tax, property taxes, payroll taxes)? Based on available payroll records do the buyer and seller appear to have a sufficient number of employees to justify the transaction volumes on the proposed invoices? What is the buyer's/supplier's history in the trade? Does the deal carry no commercial risk—e.g., no requirement to pay for goods until payment received from customer? Does the deal involve consistent or predetermined profit margins, irrespective of the date, quantities or specifications of the specified goods traded? Does the supplier (or another business in the transaction chain) require third party payments or payments to an offshore bank account? Are the goods adequately insured? Are goods of high value offered with no formal contractual arrangements? Are high value deals offered by a newly-established supplier with minimal trading history, low credit rating, etc? Can a brand new business obtain specified goods cheaper than a long-established one? Does the volume purchased (or sold) fit within normal trading patterns for these companies? The prior discussion of blockchain proposes a blockchain of the supplies as they move across borders. It moves DICE to the cloud and applies blockchain technology to create a secure train of commercial activity. There remains an element of the centralized ledger in that discussion, because it is not clear how freely governments will share databases. The origin jurisdiction may perform its AI risk analysis with data that is confidential, and may not allow the destination jurisdiction to access this material when it performs its own analysis. The consensus that these jurisdictions reach may predominantly be of their own taxpayers, and it may be the threshold will need to be raised in some instances to arrive at an acceptable level of trust. This is not the case with the VATCoin proposal we made to the Gulf Cooperation Council (the “GCC”, comprised of six Middle Eastern countries—Saudi Arabia, Kuwait, the United Arab Emirates, Qatar, Bahrain and Oman). VATCoin is modeled on Bitcoin. Both Bitcoin and VATCoin are distributive ledger applications built upon blockchain technology. Bitcoin's ledger is public; VATCoin's is private. If adopted, VATCoin could well become the world's first government-mandated crypto taxcurrency. Unlike Bitcoin, VATCoin will not be a speculative currency. It is always fixed to the home currency. VATCoin could be implemented in conjunction with DICE or a blockchain of the supplies (discussed above). VATCoins are a digital, not a physical currency. They are only recognized for payment of VAT. 16 Transactions in VATCoin will be chronologically registered on a distributed ledger. The validity of each transaction will be verified by government (tax administration) nodes from each jurisdiction. The number of nodes contributed by a jurisdiction will be proportional to the GDP of that jurisdiction relative to the aggregate GDP of all jurisdictions in the economic community involved. Each enterprise involved in a VATCoin transaction will have access to the transaction records of all the VATCoins it has held. In the GCC proposal, the VATCoin blockchain extended throughout the six Member States. Valid transactions would be aggregated in blocks, which would be cryptographically sealed and attached to the next block in the chain approximately every 10 minutes. The verification and sealing mechanism is by 75 percent vote of the active nodes of the network. – throughout the GCC, VATCoins must be recognized as non-redeemable currency, convertible into cash only by the government. Governments will need to issue cash refunds in instances where a VAT return has a verified negative VAT due. – after a waiting period, a smart contract will issue refunds (daily) whenever a taxpayer's account shows a negative VAT due balance. Daily balancing of VATCoin accounts will be the norm, but rules may be implemented to delay significant refund amounts until a more thorough risk analysis/ audit is performed. A reasonably thorough example was designed for the GCC to bring out application issues in a VATCoin scenario. That example follows. Assume all six members of the GCC have adopted a five percent VAT conforming to the GCC Framework. Assume further that the Framework includes a VATCoin provision. “C” is a business in Saudi Arabia that manufactures a range of concrete building materials—from standard cement blocks, to specialty concrete structures, and large reinforced concrete beams for highway bridges. C has large supplies of sand and water in Saudi Arabia, but needs to purchase 1 million Saudi Arabian riyals (”SAR”) in cement from supplier “B” in Bahrain, 18 and SAR40 million in heavy construction equipment from supplier “A” in Japan. All of C's output is sold for SAR8 million to “D,” a Saudi distributor of building supplies. D resells half of its inventory for SAR5 million to contractor “E” in the United Arab Emirates (“UAE”) that is building highway overpasses for the UAE government. D resells the other half of its inventory for SAR5 million to contractor “F,” in Saudi Arabia who is building personal residences in Riyadh. The UAE pays 97,939,131,836.99 Emirati Dirham for bridge construction, which is equal to SAR100 billion. The five personal residences built by F sell for SAR2 million each. Figure 3 diagrams the supplies of concrete products in the common example, and the payments made for the supplies. It also shows the flow of VATCoins in the GCC Cloud associated with the each of the supplies. It assumes that 1 VATCoin = SAR10,000. the GCC VAT in this diagram is immune to cyberattack. All VAT is held in the GCC cloud. Traders never hold VAT. Missing trader frauds always revolve around a trader who holds VAT on behalf of the government who then disappears without filing a return and remitting the tax. VATCoin solves this fraud by taking VAT out of the hands of the traders. With VATCoin, each taxpayer's VAT account will be balanced daily in the GCC cloud. Funds will be remitted to the treasury daily (from the accounts where the balance is positive). Refunds can be determined just as quickly (from accounts where the balance is negative). Smart contracts facilitate these payments. VATCoin is cryptocurrency. It has no material representation. If VATCoins are stolen they immediately become worthless. A black market for VATCoins is not possible. Similar to the consensus mechanism employed in the blockchain imposed on supplies (above), there is a consensus mechanism in VATCoin that verifies the transfer of the VATCoins. Transactions in VATCoin are relayed to the tax administration, and then forwarded to the GCC cloud where nodes with AI functionality track and approve the transfers. (see Figure 4). Blockchain is coming to tax compliance. In instances where blockchain technology and distributive ledgers replace centralized ledgers there will be some disruption (turmoil) surrounding the change, but the overall movement will be toward ever-greater efficiency, security and transparency. It is likely that blockchain will come first to jurisdictions like the GCC, where there is no pre-existing tax system to be “disrupted.” This is the familiar technological “leapfrog” effect, where jurisdictions without an established infrastructure in place can quickly move to new technologies without needing to pass through the entire development process: this is a common occurrence in African economies. For those who are attentive to the coming blockchain disruption there are some precursor developments already visible. In the restaurant sector, Quebec mandates encryption of transaction data, requires the monthly submission of a digital summary report, performs AI-base risk analysis on the aggregate data streams to identify fraud patterns, and completes most audits remotely. Rwanda has gone further. It implemented a DICE compliance regime for all businesses, and requires full transactional data transmission daily (not just summary reports submitted monthly). Rwanda performs the same AI-based risk analysis for fraud detection. In addition, Rwanda appears ready to adopt a cross-border DICE system with neighboring Tanzania. None of this is truly blockchain, but it is getting very close. Data is digitally preserved and encrypted for security purposes. The difficulty is that Quebec and Rwanda send the data to a central location where it is stored and AI scrutinizes it for fraud patterns. Blockchain requires the same degree of data scrutiny, but instead of using it only as a springboard for in-depth audits, blockchain uses it to validate the transaction itself. With blockchain—the code is the law. Technology forces compliance. Non-compliant transactions do not go through. No jurisdiction has taken this “next step”—blockchaining either the supply-side or the VAT payment-side of all commercial transactions. However, the path from Quebec's limited application to Rwanda's DICE suggests that this step will be taken soon. The authors believe that the GCC is the ideal candidate to take this step. There is no centralized tax ledger in the GCC, so there is no ledger to disrupt, just a cutting-edge way to design a VAT system that takes advantage of the newest technology and world-class insights into how best to manage a multi-jurisdictional VAT. It is easy to imagine that the 2018 adoption of a VAT in the GCC may come with one or both of the blockchain applications discussed here. There will be no disruptive turmoil when the blockchain is introduced. Nothing was there before. 1 Adjunct Professor of Law New York University and Boston University, Richard.Ainsworth@nyu.edu; VATprof@bu.edu. 3 A ledger, as used in this sentence and in this field generally, means a value recording and transfer system. Simply stated, a ledger is an accounting tool that keeps track of who owns what. The ledger itself is a very old technology that has not changed much since its development by the Venetian Republic in the 15th century. Ledgers have long been digitized (in the 20th century), but it was only with blockchain that they have been decentralized. Prior to 2008, ledgers were only understood as centralized. 4 Satoshi Nakamoto, Bitcoin, A peer-to-peer electronic cash system (2008) available at: https://bitcoin.org/bitcoin.pdf (note: Satoshi Nakamoto is a pseudonym). 7 Cryptoeconomic incentives are most strongly associated with cryptocurrency systems. Bitcoin mining is such an incentive system. This is because Bitcoin uses pseudonymous and anonymous nodes to validate transactions, whereas a basic distributive ledger that engage entities with legal identities (banks, financial institutions, government agencies) will use “permissioned” nodes to validate transactions. This proposal of DICE on a blockchain uses permissioned nodes. For this reason, a basic distributive ledger is able to host off-chain assets (smart contracts) due to their authenticated, permissioned approach to validation. Tim Swanson, Consensus-as-a-Service: A Brief Report on the Emergence of Permissioned, Distributed Ledger System (April 6, 2016) available at: http://www.ofnumbers.com/wp-content/uploads/2015/04/Permissioned-distributed-ledgers.pdf. 8 The Economist, The Promise of Blockchain: The Trust Machine (October 31, 2015) available at: http://www.economist.com/news/leaders/21677198-technology-behind-bitcoin-could-transform-how-economy-works-trust-machine. 10 Gordon E. Moore, Cramming More Components onto Integrated Circuits, Proceedings of the IEEE, Vol. 86, No. 1, January 1998) reprinting the same title from Electronics, 114-117 (April 19, 1965) available at: http://www.cs.utexas.edu/~fussell/courses/cs352h/papers/moore.pdf. Mr. Moore is the founder of Intel and Fairchild Semiconductor. 11 Mark Kryder, Kryder's Law, Scientific American (August 2005) available (as a reprint) at: https://web.archive.org/web/20060329004626/http://www.sciam.com/article.cfm?chanID=sa006&colID=30&articleID=000B0C22-0805-12D8-BDFD83414B7F0000. Mr Kryder was the senior Vice President of Research and the Chief Technology Officer at Seagate Corp.
12 Jakob Nielson, Nielson's Law of Internet Bandwidth, Nielson Normal Grouphttps://www.nngroup.com/articles/law-of-bandwidth/. Mr. Nielson was an engineer at Sun Microsystems. 13 A blockchain is simply a chronological database of transactions recorded by a network of computers. Each block is encrypted and organized into smaller datasets referred to as “blocks.” Every block contains information about a certain number of transactions, a reference to the preceding block in the blockchain, as well as a consensus notation indicating that the current block has been validated. Thus, each block contains the hash of the previous block, which thereby fixes the current block as the sole antecedent. All operations in the blockchain are validated through a digital fingerprint created through a particular hash function (SHA256 is used by Bitcoin). All transactions incorporated in the blockchain are mapped into a fixed-length string of data. Any differences in input data will produce differences in output data (and thus a different digital fingerprint). See: Aaron Wright & Primavera De Filippi, Decentralized Blockchain Technology and the Rise of Lex Cryptographia, at 6–7, available at: http://papers.ssrn.com/sol3/papers.cfm?abstract_id=2580664. 14 SmartCloud Inc. performs risk analysis for 60,000 taxpayers handling two million transactions per day. AI of this quality installed at each node could more than handle the commercial transactions on a DICE blockchain. Personal communication, Paul Lindenfelzer, Partner, VP Sales and Operations, SmartCloud, Inc., (Bedford, MA) July 11, 2016 ( plindenfelzer@smartcloudinc.com). 15 For other examples see the due diligence requirements listed at: HM Revenue and Customs, VAT Notice 726: joint and several liability for unpaid VAT available at: https://www.gov.uk/government/publications/vat-notice-726-joint-and-several-liability-for-unpaid-vat/vat-notice-726-joint-and-several-liability-for-unpaid-vat . [Bitcoins are] a huge disappointment. Looking at the numbers on a screen didn't move me. That's it? What does it really look like? What can I show my children? It turns out that Bitcoins (more precisely, a “wallet”) can be represented in less than a hundred bytes. Everything else is contained in a giant shared database, a chain of signed blocks of data, on computers all over the internet. But there's no reason why that representation can't be printed and exchanged just like physical money. All you need is a standard format. So I designed one. 17 There are a range of opinions on smart contracts, from the clinical, technological definition and no more (Swanson), to a balanced pro and con that wants to wait for more evidence (U.K. Chief Science Advisor), to an enthusiastic, visionary advocate who can see the world changing rapidly because of them (Wright & De Philippi). A smart contract is a simple rules engine; cryptographically assured business logic that has the ability to execute and move value. Tim Swanson, Consensus-as-a-Service: A Brief Report on the Emergence of Permissioned, distributed Ledger Systems (April 6, 2015). Smart contracts are contracts whose terms are recorded in a computer language instead of legal language. Smart contracts can be automatically executed by a computer system, such as a suitable distributed ledger system. The potential benefits of smart contracts include low contracting, enforcement, and compliance costs; consequently it becomes economically viable to form contracts over numerous low-value transactions. The potentials risks include reliance on the computing system that executes the contract. U.K. Government Chief Scientific Advisor, Government Office for Science, Distributed Ledger Technology: Beyond Block Chain, at 18 (December 2015). Blockchains are not just powering digital currencies. They are also enabling the creation of smart contracts, one of the first truly disruptive technological advancements to the practice of law since the invention of the printing press. Using a distributed database like blockchain, parties can confirm that an event or condition has in fact occurred without the need for a third party. … To date, smart contracts have mostly been created to automatically execute derivatives, futures, swaps, and options. … The development of smart contracts is expanding rapidly. Over the past several months, a number of open source projects – such as Ethereum, Counterparty, and Mastercoin – have been developed to create programming languages that enable the creation of increasingly sophisticated smart contracts. Using these programming languages, smart contracts could be used to enable employees to be paid on an hourly or daily basis with taxes remitted to a governmental body in real time. 18 In reality, Saudi Arabia is a producer of cement at very competitive prices, although the price may be attributed in large part to energy subsidies. Firms in Saudi Arabia are pressing for export licenses. The government is considering an export tax to recover the subsidies. This example assumes that there is a temporary shortage of Saudi cement, and imports are needed from Bahrain to cover the shortfall. 19 Lawrence Lessig, Cyberspace and Privacy: A New Legal Paradigm? 52 Stanford Law Review 987 (May, 2009) (referencing the conclusions he reached in his book, Lawrence Lessig, Code and Other Laws of Cyberspace (1999)).